In case you didn’t know, I’m going to Surtex! 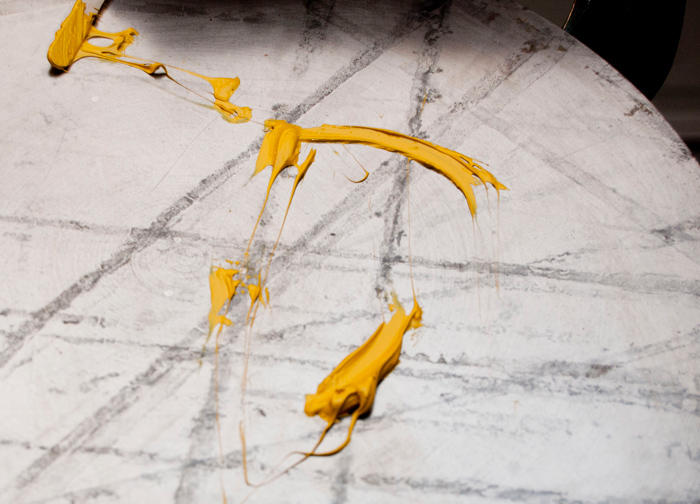 Here is my new website just for surface design. I have spent the past four months preparing for this show. And I really wanted to do something special for business cards. My Little Things Studio cards are fine, but nothing is super special about the size, paper, etc. And I really am trying to stand out at Surtex. 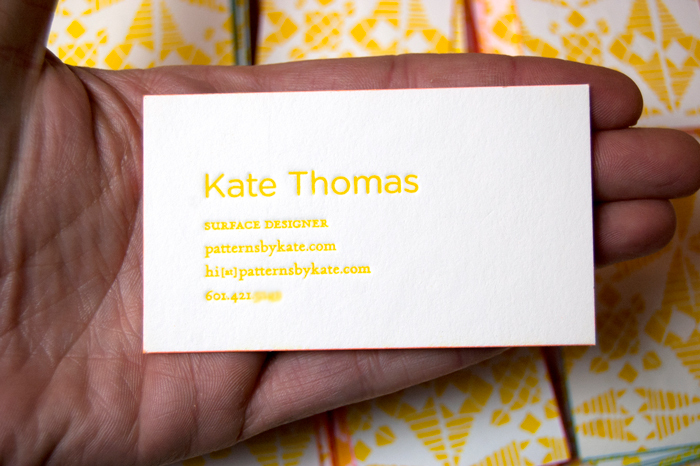 My roommate (the incredibly talented Kristen Ley) graciously told me she would letterpress me some business cards!!! I thought it would be YEARS before I would be able to have this. I can’t believe she gave me such a special gift – her talent and time. This was a very labor-intensive project. 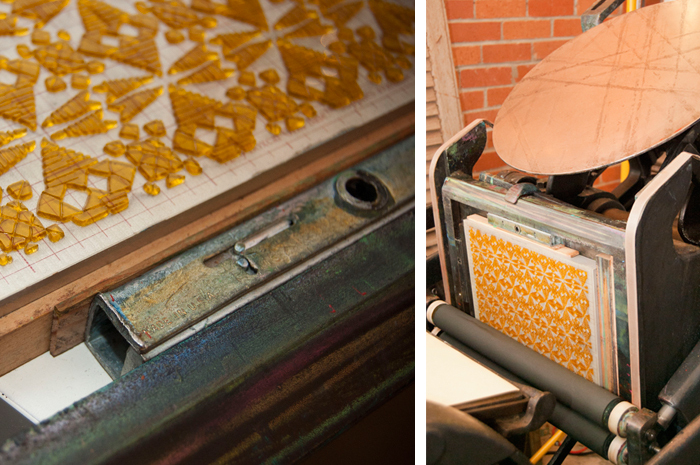 And sometimes dangerous…Kristen almost broke her finger on the 2nd night of working the press! She was picking up a piece of paper from inside the press when it was slowly moving and her finger got caught for a second there! It was horrible. I grabbed the keys, ice, and Advil, thinking I was about to take her to the ER. But she decides she’s going to tape up her hand and keep working! Ah! The next morning she went to get an x-ray and it was miraculously not broken! I still can’t believe that happened! It was so scary, because that was her right hand pointer finger – the hand she uses to draw and paint! We are all so thankful it is okay. Before I go any further, I have to say without Kristen, Dave, and my mom, these cards wouldn’t have gotten finished. Kristen printed them for me. Dave cut them, and my mother did the edge painting. Card details: Crane Lettra 220 lb. fluorescent white, printed front and back with neon colored edges. And of course they are yellow! There are only 800 in existence. I am so proud and so very thankful. The plate is locked and loaded and ready to go. Willow (Kristen’s goldendoodle) will eat just about anything, including yellow ink. Weezie watched the entire time from the washing machine. She wanted to be outside with us so much. My phone number is on there this time! The back of the card is one of my patterns. 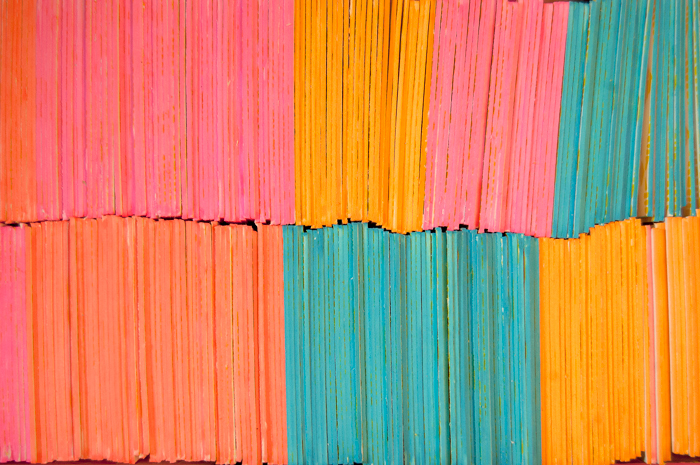 Cards are edge painted in NEON pink, coral, orange, and teal! Side view of the cards all stacked together! SO I guess you are wondering how we did the edge painting, right? 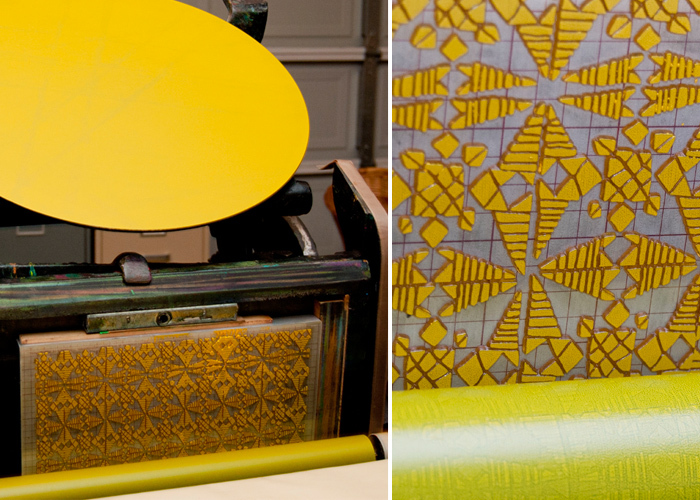 Well, the letterpress community is very tight lipped about this process. Kristen contacted different letterpress folks and I called friends I knew and we found there is no one set way to do it. And there would be a lot of trial and error. Kristen suggested trying Letraset Markers. Well, I ordered them, but they bled onto the page. I tried draining the ink and just using the little bit left. That worked, but I couldn’t get a solid coating on the edge of the paper. I then just tried Crayola Markers AND THEY WORKED! They didn’t bleed, gave a solid coat and everything! We were shocked! I ended up buying a pack of the Rose-Art Neon Marker Pack and used my favorite four markers from there. NOW I will tell you that these cards do bleed if you spill water on them now. 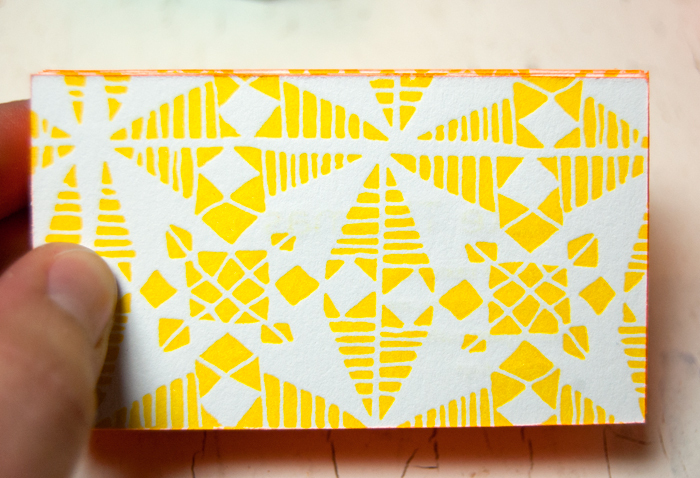 I went back and dipped some of my edge painted samples and they didn’t bleed on the paper. So I am not saying this is the best way to do it. It has to be what works for you. But who in the world is going to get these fab cards near water!?!?!? You’ll want to frame this card it’s so fab! I’m so very thankful to Kristen. Please click here to see her amazing work. Hope you enjoyed reading about this process! 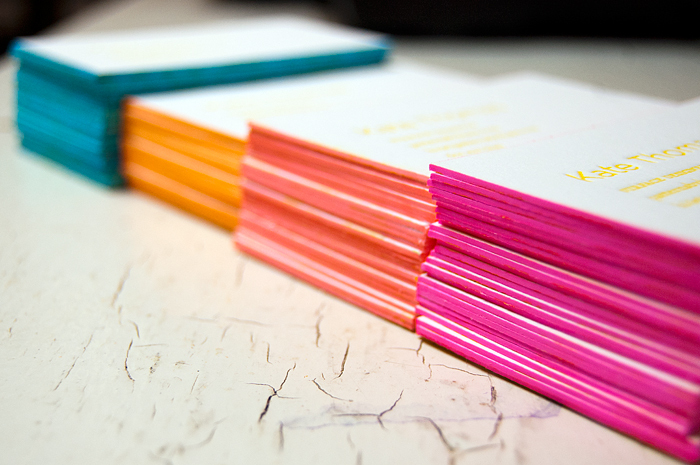 Very nice use of colours on business cards…keep it up!! Amazing! Your business card looks good enough to eat! Those coloured sides, ohmygoodness they’re perfect. Thanks so much for sharing! Those cards are AMAZING. And they clearly represent what an amazing artist she is! It was great meeting you at Surtex, Kate! The cards turned out great! I love the painted edge and the thickness of them:). These are absolutely gorgeous! Love everything about them…including how you photographed them.